Every year we go into a period that I call “The Moon Wars”- its the perennial Muslim calendar event, a sort of “I can piss further then you can” showcase except it involves whether or not to use the moon sighting method to begin and end the most holy of holy months in the Muslim year, Ramadan. Naturally the Islamic calendar follows the lunar methodology in setting its dates, it has since Islam was established with Adam and through Moses and on down to Muhammad (peace shower on all of them!). This “war” has gone from the living rooms and Mosques into the social media world, each year its the same thing over and over again. There are different schools of thought on how to implement date setting within Islam. It covers the spectrum from the strict traditionalists who look for the moon in the location, and only in their location, to people who use astronomical calculations to figure out the dates of when the moon sighting could happen, via probability- but one thing underlying this debate, its intense and sometimes unforgiving. To me this intensity over the moon sighting, which people say is trivial, is actually a good point of reference point on gauging the personal investment people have to religion. I would be worried if we didn’t care about things like “to moon sight or not” because it means we don’t care about the finer points of religion and therefore have a distant relationship with the religion, its text, and principles. So bring on the “Moon Wars” I preach, but lets do it with dignity and civility, please? Unfortunately the the park was closed and the access roads were chained up, however, we found a dirt road traversing the north side of the park which contained a good number of Joshua tree groves were we set up shop, she in the hopes of enjoying the stars, me in the hopes of trying out my astrophotography skills, or lack therefore. Our main purpose, therefore, wasn’t to go moon sighting, which is good, because theoretically it was impossible to see the new moon tonight! And anyway, I personally would follow the calendar convention, which basically is a mathematical setting of the Islamic lunar calendar, for many reasons that I will neglect to go into here. However, I am not independent of my family, my father is the head of our family and I do as he does, so my methodological school boils down to the “Parental Unit Methodology” which basically means when my parents start and end Ramadan governs what I do. The idea of going and doing moon sightings is the way the Islamic calendar has been set for the past 1400 plus years. They still do it today in many parts of the world. My parents of this school of thought, however, they have not gone moon sighting in over a decade. Instead, my parents rely on other people in our community, who also believe in the moon sighting method, to establish the beginning and end of the month. They in turn rely on other people and those people rely on other people and so forth. In the end I think our method boils down to when Saudi Arabia decides to see the moon, or not. So really the method we are following is the “Saudi Moon sighting method.” One thing that is pretty spectacular about the “Moon sighting” method is that it requires a physical eye, someone trustworthy and who’s opinion is respected by the broader community, to have seen the new moon. And if you have ever tried to go out to see a “new moon” then you know how near impossible it is to see the moon with the naked eye. And anyway, my sister and I ended up not catching sight of the new moon whatsoever. According to the app we were relying on to figure out where the stars were going to be, the new moon set with the sun immediately after “being born.” Worse even still was that being thirty miles outside of the urban zone that is Palmdale-Lancaster, we could barely see a fraction of the brilliance that is the night sky. It was muted by this reddish-orange glowing dome emanating over the horizon, almost like a fake sunrise, to the east of us. It was this fake sunrise glow that taught me about this phenomenon called “Light Pollution” and a movement by astronomers and stargazers and environmentalist called “Dark Skies” to counter the amount of artificial light polluting the night skies. People do go out to look for the new moon as Islamic tradition mandates. Which is a form of ritual- you go with a group of other believers in search of the moon, requiring you to leave the urban sprawl and light pollution and go into the wilderness to stare up at the dark night sky. Thats pretty amazing too me. There are good rituals and bad rituals, I think its important to differentiate this because in my activism and community leadership I have railed against “rituals” and have only come to realize now that there needs to be much more nuanced argument presented when discussing rituals. Doing something for the sake of doing it because thats how it was done, to not have heart or meaning behind it or to believe in the actions you are doing is, to me, a form of idol worship and that is inconsistent with the spirit of Islam that begins and ends with the idea that God is One. We shouldn’t just do things because they are to be done the way they have been. This aspect of going to go look for a new moon is on the other hand a sort of good ritual. First its upholding a prescribed Islamic practice that was instituted by the Prophet. Second, its getting us to leave the comforts of our homes and the security of our community to go out into the wilderness. Which brings me to the last point of this post- Its sad but in our cities we only see a small fraction of the night sky. We’ve blotted out the brilliance of the stars and galaxy with our artificial, energy consuming lights. 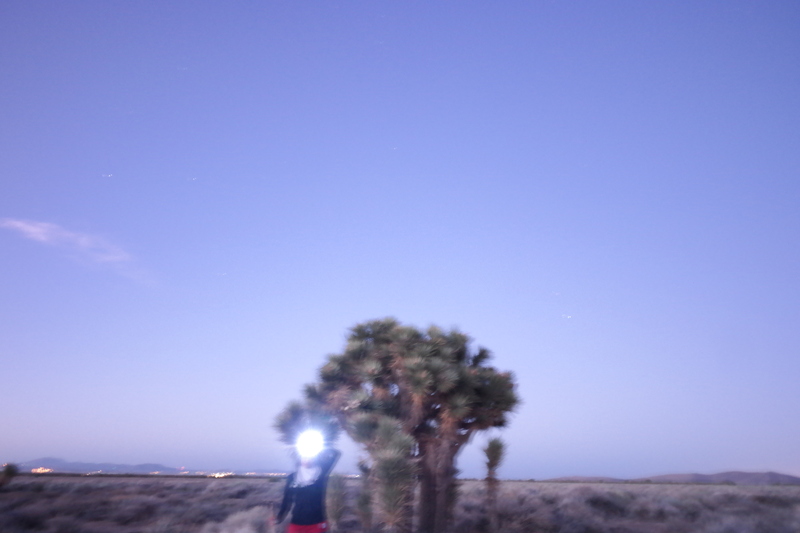 To truly practice this tradition, or to enjoy the magnificence of the night sky, people in Palmdale, like me, will have to drive two hours further east, north east or south east in order to be able to gaze up in wonder at the full beauty of the heavens. Two hours for us, but for Angelenos and Orange County residents thats an extra one-and-half to two hours on top of the two hours to escape the light pollution. 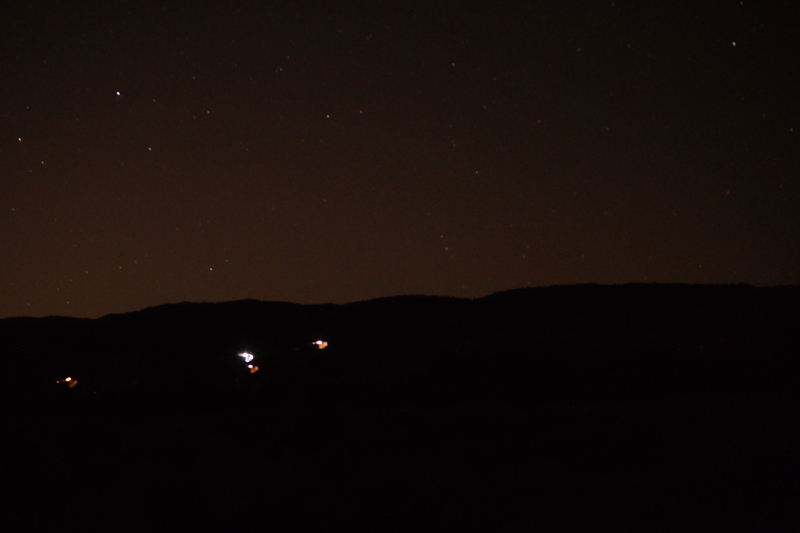 In fact the light pollution is so bad that famous observatories like Palomar and Mt. Wilson and Griffith are threatened by it because their telescopes are affected by all the artificial light at night. What drove this point home to me was my feeble attempt to capture images of the Milky Way. Basically the lights from near by (some thirty miles away) homes and street lights were stronger then the stars. According to astrophotographers, the brightness of the stars should allow the camera to focus and take shots of the sky, but for me it didn’t happen. 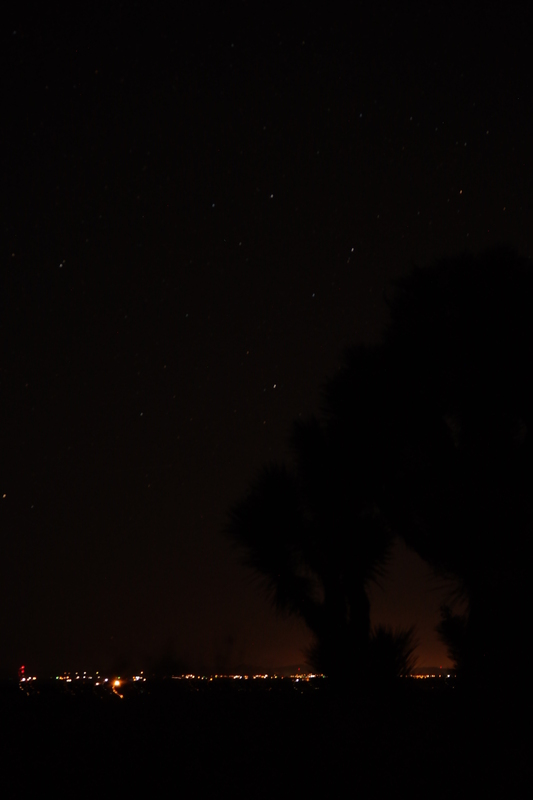 Instead I had to focus on nearby lights in order to capture the stars shining above or near the orange-reddish glow. Well I guess its Ramadan for us on Sunday over here, thats what our local Masjid announced at Jummah prayers. I pray your Ramadan is blessed with peace and serenity, spiritual growth and personal fulfillment. I pray that those who suffer discrimination and oppression find peace with Allah and through him the strength to manage and carry on in their struggle. I pray for a peaceful future and a society that lives the Prophetic example of peace. I wrote this blog series two Ramadans ago, so I share it again with you this here- the first ten days are Rahma. How do you differentiate between good and bad rituals? Is there a clear way to do so? I’m personally more a believer in the Talmud verse attributed to Rabbi Yehudah Hanassi : “Be as attentive to a minor commandment as to a major one, for you do not know the reward for each of the commandments” (Pirkei Avot, 2:1). Hey Vanessa! Thanks for the message! Great to see your comments and get an opportunity to engage, hope all is well and congrats on the wedding! So I actually have to admit that my “ritual” comment needs contextualize and its not really well done here or something I can do in my comment. I don’t want to tangle up sin and ritual here, and realize the two can be often intertwined. But in response to your question I will say that Rabbi Hanassi is converging on something that is a common Islamic precept. Major sins are really bad, their is one unforgivable sin however, thats to associate with God things, people or principles etc. However, we also have the famous story of Baseera where the monk is lead into this major sin through the perpetrating of fairly minor sins. These minor sins slowly change and remold his ability to judge right and wrong over time and he falls into the trap of self justification until he commits the final unforgivable sin of associating power to Satan that belonged solely to God. In terms of ritual, I was getting at the idea of going through the motions of prayer, but not really having your heart in the prayer. Or ritual in that someone dies and the family go through the processes of observing certain events and commemorations, none of which have any benefit to the deceased or to the living but because thats what is culturally accepted and made to fit as being Islamic, people just do it and expect others to do the same. There are other rituals, such as South Asian wedding rituals that have their roots in Hindu religious practices that have been incorporated into Muslim weddings, which are completely against the essence of what Islams approach to marriage is all about- I am pointing this out as a ritual that in my opinion is “bad” but I am not providing the evidence or the details to really explain where I am coming from because I fear thats just too long of a post and beyond my area of expertise.